Temperance is the 14th Major Arcana card. Quite pleasing after the prior Death card, Temperance shows an angelic figure crowned with the halo of the Sun. Temperance as a definition means abstinence from alcohol. The meaning of the card can be interpreted to mean abstinence generally. The card also represents balance; duality is a concept that exists everywhere, you just have to look for it. Temperance represents moderation, self control and balance. Past – Temperance in the Past position means that things have been relatively stress free in the recent past. It’s acted as a good foundation for you to thrive in whichever field you’re interested in. It can also represent a tragic past event that you’ve grown from and it has made you who you are. Present – Temperance in the present position means you should be practising moderation. don’t go overboard, don’t overwork yourself, you’ll only wear yourself out. If anything bad is happening in your life, remind yourself that it’s going to end soon. Temperance means that balance will be back in your life. Future – The future position is the best position for Temperance when used in a time based spread. It means that things will work out in future. Things will be balanced. Work / Education – Temperance in regards to work or education is an easy one to interpret. have balance in your life. Are you working too hard or too little? The biggest regret people have when they die is that they didn’t spend enough time with their family. Work isn’t everything. Achievement is only relative. Make sure you spend some time doing what you enjoy. Romance – Temperance in romance again stresses balance. It might be worth analysing your relationship, is it at all toxic? Have you changed in ways you didn’t wish to? As always, it might be worth having some ‘alone time’ now and then. Friends – Temperance in regards to friendship means you might be spending too much time around the same people, or if you’re neglecting your friends; not enough time. Be sure to contact them, but if you feel like you’re the one starting all the conversations, it might be time to back off. Money – Temperance in regards to finances means things will start to even out if you’re in debt. 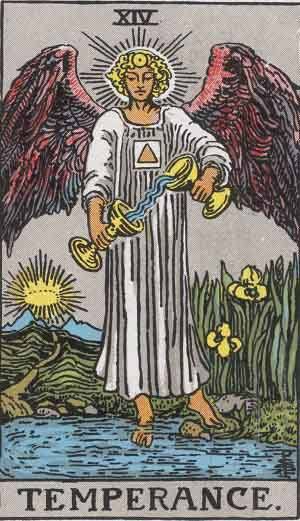 Temperance is generally a good card in regards to finance. Don’t expect any sudden surprises either way, a lottery win isn’t coming, but neither is a big payout. Don’t worry. If you’re not well off with money, it might be good to think about the balance of incoming and outgoing finances. Is there anyway you can cut down on expenses, or do you have things you don’t need that could be sold? Health – Temperance reminds you that your body is made up of the things you take in, physically and mentally. Treat it well. It’s a reflection of who you really are. Spirituality and Mentality – Temperance in spirituality means now is a good time to just ponder on your inner thoughts and desires. As always, it’s good to take a bit of time, say 10 minutes a day, to sit in silence and just think. You don’t have to think about anything in particular, just let your mind wander. You might receive answers or grasps a concept you’ve previously missed. Consider any imbalances in your life, particularly to do with moderation. Are you overindulging in a certain aspect of your life, or looking for escapism when you need to face the real world? It is tempting to forget our problems through alcohol, food, or entertainment. As a person, you are stunting your growth if you ignore the difficult parts of your life. Look for others doing the same. The best thing you can do with your life is help others, and there may be others close to you who are having trouble dealing with their problems through overindulgence. We’ve selected live tarot readers to give you a FREE 3 Minute interpretation of the Temperance Tarot Card! Scroll through them below and pick your favorite one.